Erin teaches beginning and level 1 & 2 nose work classes at For Your K9. 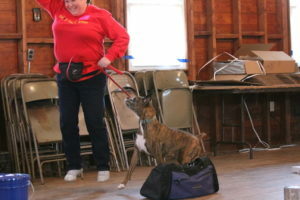 She began dog training when she and her husband, Tom, got their first dog, a Boxer, 9 years ago. They now actively train and show their 3 Boxers. Erin has been a member of Lyons Township Dog Training Club for almost 9 years and an instructor with the club for 5 years. She has taught AKC Rally, Basic Obedience, and now an Agility Foundations class. She competes with her own dogs in NACSW nose work, AKC Obedience, Agility, and Rally, Canine Performance Events Agility and NADAQ Agility. She is a board member of the Mid-West Boxer Club and a member of the Tree Towns Boxer Club and the American Boxer Club. She serves as Trial Secretary/Chairperson for the Mid-West and Tree Towns Boxer Clubs specialty AKC Obedience/Rally Trials. She believes it is a duty of each handler to give back to the sport by mentoring new handlers to train and show their dogs and by volunteering their time. She has volunteered at numerous agility, obedience, and rally trials, and nose work trials or events. No matter what the role, she has always learned from the experience. She works to grow her skills as a handler and instructor by taking classes and attending seminars with her dogs. Her training philosophy is to keep it positive for the dog and fun for the handler. Of course, it has to be fun for the instructor too!